Here are 7 deep questions to ask yourself – before you start dating – if you want to find true love with your soulmate. Whatever your reason is, it’s important to know why you’re searching for love now. 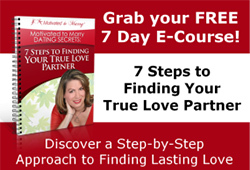 It can help you gauge how important it is that you find your ideal mate at this particular time in your life. Also, you may want to see how your reasons line up with the people you’re dating, too, to understand their motivations for wanting to find true love. Now it’s time to think about your time frame for meeting your Mr./Ms. Right. Do you want to be in a relationship within three months, six months, one year, or five years? Setting your timeline will help you establish realistic expectations about what comes next. No matter what goal you’re tackling, it’s always good to plan for the unexpected. And your how-to-find-true-love plan needs to include dealing with the unexpected, too. Then, before you know it, you’ll have met that special person, and there’ll be a recognition that you’ve finally found true love with your soulmate.